This is a WORLDWIDE giveaway, so good luck everyone!!! FTC Disclosure: This giveaway is sponsored by Triple T Studios. Also, the links are affiliate links, which means if you click on one and buy something Mudpie gets a little money for her piggy bank! The neighbor across the street from us hates cats. We have several feral cats in our neighborhood and he's gone so far as to shoot at them and trap and dump them. We're fighting with our town, trying to get them to take action. Let's just say that I really don't like this guy. Words of wisdom! I have both family and friends who like animals, and I also know plenty of them who do not. Even in the case of family, I can't lie, I am much closer to those who like animals. I have trouble connecting with those who can harbor dislike for something so innocent and precious. 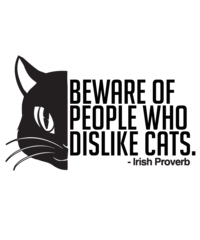 We wouldn't associate with anybuddy who didn't like cats. That's a cool saying...and a cool shirt. Hope I do this right because I would wear that shirt almost ever day! What a special T-shirt. I stay away from anyone who dislikes cats. Yes, I have some in-laws that do not like cats. No truer statement has ever been spoken! now THAT's a great T! I love the shirt. If someone doesn't like my cats that needn't knock at my door. lol! I would be privileged to sport this T.
I love this shirt! I don't expect everyone to be as enamored with felines as I am ... but I have a real problem when people try to tell me "it's JUST a cat." I really want to say, "And you're just a @#$%!" I love this quote and have said it often! Thanks! HUGS. Love that saying and the shirt! My two kittens are the love of my life. I've had cats all of my adult life and after my last cat passed away, I thought she was going to be my last pet. That thought lasted less than a month before I adopted Hamilton and Jefferson. 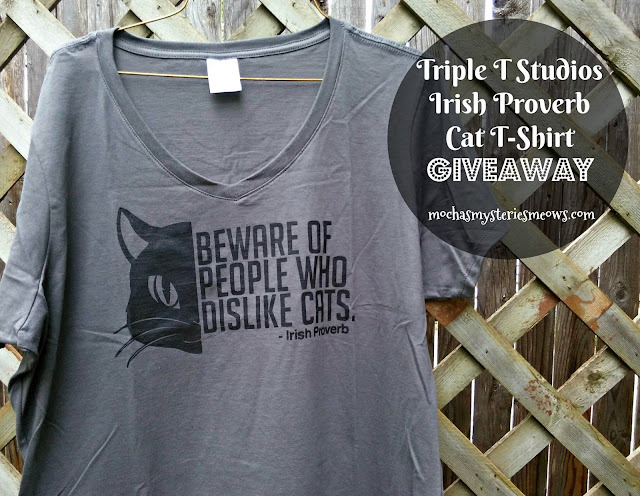 We're Irish cats and we agree with this proverb! What a fab shirt. I love the shirt. I feed strays in my neighborhood and am worried about who will be moving into the house down the street. This is really cute and looks so soft and comfortable! I only allow people in my life that share my love for cats and all animals! No, not really. Everyone I know loves cats. no, however, if my friends do not like my family furr kids, they are not welcome in my house. i am always leary of people that do not like animals. TW already bought the green one which arrived the day after St. Paddy’s Day so we’re not going to enter. I find it hilarious when cats are all over people who claim not to like cats. Haha, cats being cats! Yes my brother and husband do not like cats! Most people around me like cats. however my partner is on the fence. He sometimes gets annoyed by them. It might be because he thinks we have too many...suspicious...lol...no such thing as too many. i'm weary of my husbands friends..they are not friendly with our kitties. we have 4 and they are my babies. We have 4 and I love them to pieces. All of them are rescues and the best cats I've ever had. Yes..I love all my babies and if they don't like them they can stay home! I don't because I don't keep those kind of people around me. My mother in law does! I don't know anyone who doesn't like cats but I would not want to be friends with anyone who doesn't. Yes I do. But I would rather not name them. I don't, I tend to only really hang out with animal lovers. I have a houseful and 16 chickens, so they have to like animals. My cat is a huge old boy and very loving too. No I don`t! My furry family comes b4 "friends".